I have been dying to use this palette since I received it for Christmas and I have been testing this palette out for the last week and a half and have swatched most of the shades, as well as applying quite a few of the shadows onto my eyes. I have heard mixed reviews about this palette, as to whether it is worth buying a separate eyeshadow palette that is only full of shimmer shadows. However, every review I have read has said that the quality is just amazing and I must agree with them. In this palette there are 20 all new eyeshadow shades that have been separated into two sections. On the left hand side of the palette is 10 brighter shadows that have purples, greens, golds and even a bright aqua blue. Whereas, on the right hand side of the palette there are 10 neutral shadows that are more bronze and warm-toned shades. 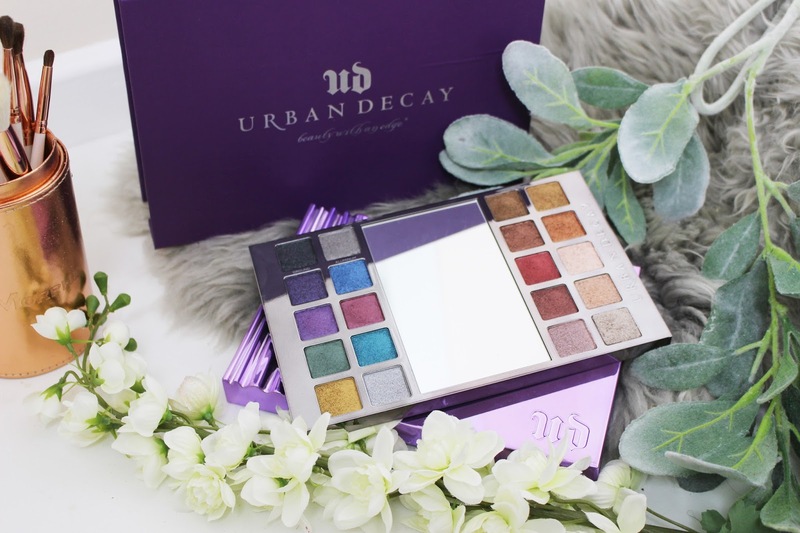 I have been using Urban Decay eyeshadow palettes ever since I started this blog, almost three years ago, and Urban Decay does know how to create a beautiful eyeshadow palette. There obviously is only one finish to this eyeshadow palette which is metallic/shimmer (although some have iridescent shimmers and some have micro-sparkles in them). I can see this being a palette that I can use with so many of my palettes that I already own and there are even colours in this palette that I do not own in my current palettes. The packaging is really the only let down of this palette - I will admit it is stunning and I love the lilac mirrored finish on the outside of the packaging, however the rest of the palette does not make sense and makes it really hard to travel with. Rather than the palette being a traditional snap closure, it instead slides out of a case to reveal the palette. I feel like this is a really cool-looking palette, but the functionality of it is not as good. When you slide out the palette (which reminds me of the Alice in Wonderland palette, that they brought out a couple of years ago), you have a fairly large mirror with ten eyeshadows either side. I do like the fact that they have included a large mirror, but I struggled to hold the palette without my finger slipping into one of the shadows, so I feel it is not a very practical palette. Also, there is nothing that really keeps the palette secure in the case. I have found that if I shake the palette, it will slide out. Therefore, it is not really a palette that I can take travelling with me; plus it is quite large for the amount of shadows that you are getting. However, I do like the fact that the shadows have been placed into two sections that all seem to compliment each other and that the shade names are on the palette itself. So, I am not a huge fan of the packaging but it is not about that and instead the quality of the eyeshadows should be what matters. At first, I did look at this palette and think I have most of those shades in other eyeshadow palettes that I already own. I would say that the more neutral section is shadows that I have seen in a lot of palettes, whereas the brighter section are shadows that I don't really own and would not usually be colours that I would wear often. However, even though I am calling it the brighter section, the shades are not neon and are very wearable and will just add a slight pop of colour to any makeup look. After swatching all of the shadows, I did realise that even though these shades are similar to other eyeshadows I already own, they are slightly different and the quality is completely different to other shadows that I already own. 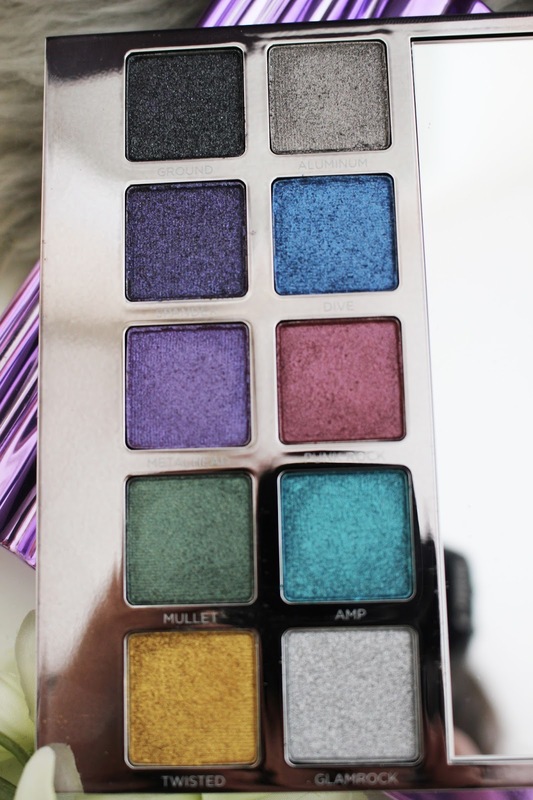 This is a palette for someone who loves to wear shimmer eyeshadows or for someone who has a lot of matte eyeshadow palettes and they want to experiment by adding some shimmer to their eye looks. You are getting the best of both worlds with this palette as you are getting the neutral shades for everyday and then the brighter pops of colour for nights out and special occasions. I absolutely love the shade selection and think this is a palette that will work all year round. The shadows themselves are so soft and buttery and they just glide so easily onto the eyes; you don't have to press hard into the pan to get an intense colour payoff. 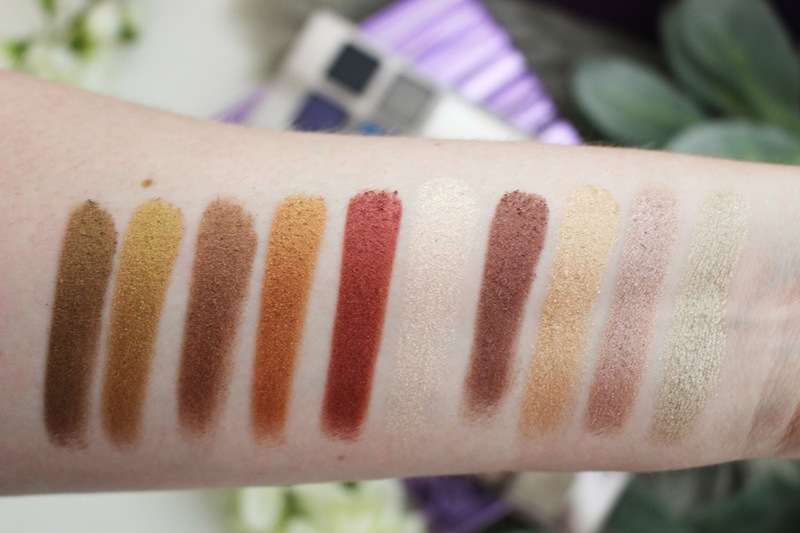 Now shimmers always swatch amazingly (and you should never rely on swatches alone) but I will often use my finger to apply a shimmer eyeshadow so in this case the swatches look almost identical to what you will achieve on your eyes. I have applied these to my eyes with both my finger and with a flat synthetic brush with some MAC Fix+ and both times they turned out beautifully. I got almost no fallout from these eyeshadows and I found it easier to pat the eyeshadow on with my finger and then use a synthetic brush to really pat it all over the lid. When I used these shadows they were so easy to use and just transformed my eye look that would be perfect for any occasion. It almost looked like a metal foiled effect and it was just stunning. I did use a primer underneath to really intensify the shadow and to make them last even longer; I found that they did not crease, they did not fade and then stayed put the whole time I was wearing them. I just hope that Urban Decay carry on making shimmer eyeshadows like these ones because they are amazing quality and are so pigmented that you don't have to layer up the shadow. This palette is great as you can transform an everyday look into something really special in a couple of minutes - you don't need to be an expert in makeup to be able to use this palette and achieve a beautiful look. I love the shades that have been included in this palette and all of them are so wearable. I will wear all of these shades at some point as they are not too bright but will just add a pop of colour to any makeup look. Of course, I am in love with the more neutral side but I absolutely love the shades Punk Rock, Twisted, Roadie, Bass and Starfire. These are definitely going to be the shades that I am going to wear all of the time. I can see this being a palette that I will reach for all year round and because they last such a long time on the eyelids, I am definitely going to be using this palette a lot. I was worried that I would not reach for this palette as much if I bought it because a lot of my palettes already have shimmer shadows in them, but these ones are just in a league of their own and I can wear them all day without having any creasing or any of the shimmer falling down onto my cheeks. The shadows are almost like a foil when I applied them to the lid and they are so easy to apply; I only had to dip my finger in once to cover the entire lid. All of the shadows are so intense in pigmentation and just have a beautiful colour payoff that will suit all skin tones. In fact there was only one shade that I was slightly disappointed in and that was Angelfire. Angelfire is a pretty pale pink shade, however it seems like this is a different formula to all the others in the palette - it is not as pigmented and it just seems to give a sheer glitter finish rather than being a foiled effect shadow. This is still a really pretty shade but it would be one that I would use either as a inner corner highlight or over the top of a matte shadow to just give a slight shimmer effect. All in all, I love the colours in this palette and I think they will compliment so many other palettes that I already own. The warm-toned shades will work well with my Naked Heat palette and all of them will work well with the other Naked palettes from Urban Decay. This is also a palette that I will be able to pair with other palettes from other brands and I am so excited to experiment with some new looks. My only criticism is that this is not a palette that you can buy on it's own to create a whole look - when it comes to eyeshadows you never really want to use a shimmer shadow in the crease. Instead, you always want to use matte shades in the crease and blend it with another transition shade that is also matte. 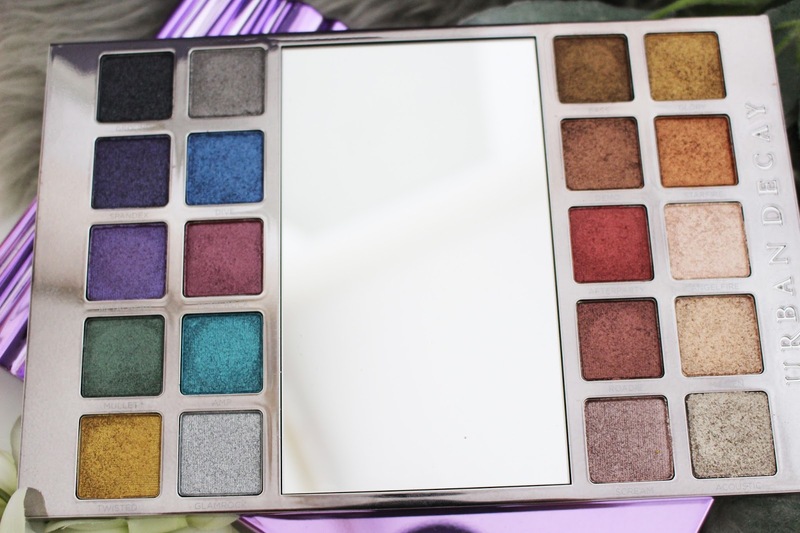 This palette is perfect if you own a lot of eyeshadow palettes that have mattes in them, but if you are starting out in makeup then you might not want to buy a palette full of shimmer shadows. However, if you own other palettes I would definitely recommend this palette as I am obsessed with the quality of the formula and the colours chosen. All I have to do it use another palette for a matte transition, crease and blending shade and then I top it off with one of these shimmer shadows. 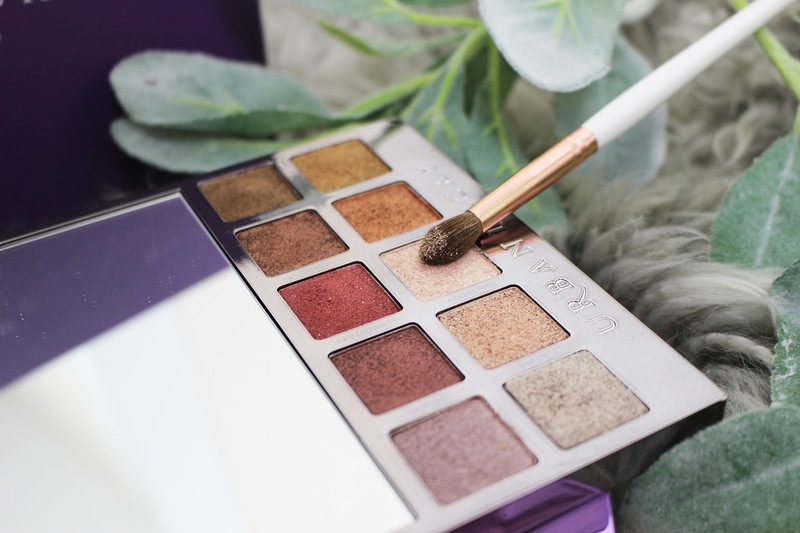 Using two different palettes does not slow me down when I am doing my makeup and I would definitely suggest having this or any of the other shimmer palettes I mentioned in your collection. Although if you can get your hands on this one then I would definitely suggest buying this one first! In this palette, there are 20 beautiful shimmer shades that are perfect for adding to any matte eyeshadows that you already own. The palette, itself, is split into two sections; the brights and the neutral/warm toned shades. This palette has warm reds, bronzes, purples and even a really pretty aqua blue shade. It really is a palette for anyone who loves to wear shimmer eyeshadows! 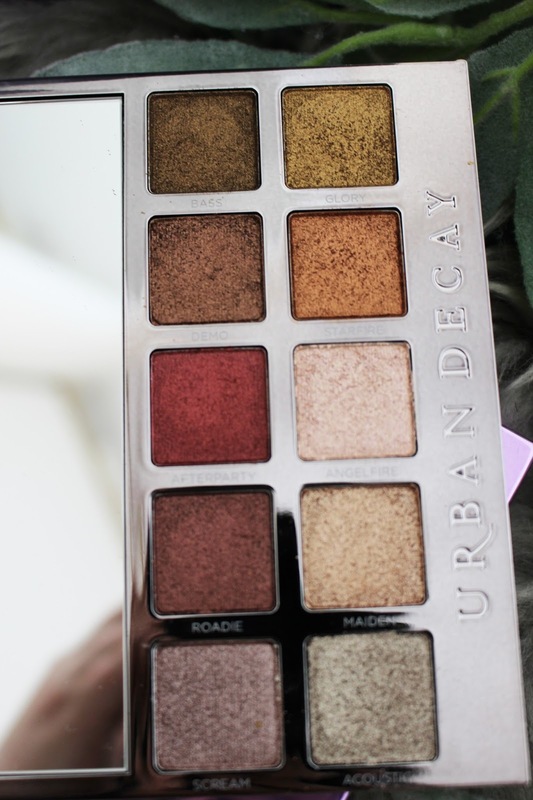 In terms of formula and pigmentation, I am so impressed with these shadows and Urban Decay have really hit this palette out of the park. I have not tried any of the other all shimmer palettes from Too Faced or Kat Von D, so I cannot talk about the quality of their palettes. However, I do own other palettes from Too Faced that have shimmers in them and they do not compare to the pigmentation of these shadows; even other Urban Decay shimmer shadows are nowhere near as good as these ones. Obviously I had to use some matte shades from other palettes to create a finished look, but these shadows just transform any look and they are so quick and easy to use. They don't settle into any fine lines and they don't crease throughout the day - I found that they lasted around 7-8 hours on me and that is plenty long enough. I love how I can transform a daytime look into something that I can wear on a night out in seconds and all you have to use is your finger (you don't even need any expensive brushes). This is perfect for a beginner in makeup or as an add-on palette for a makeup expert. I think this will become my go-to palette for when I am wanting to add a bit of sparkle to my makeup look. You can easily apply these shadows just with your finger, but you can also use a small flat synthetic brush with some MAC Fix+ to really make the shadows pop even more and look more like a foil rather than just a shimmer. I got very similar results with both applications but it did look more like a foil with the MAC Fix+. I actually preferred these shadows when I just used my finger as I thought it looked more wearable - so it just depends on what look you want to achieve. However, if you are going to use a brush then I would definitely recommend using some sort of setting or fixing spray to wet the brush. I am just obsessed with the metallic finish that these shadows give me and every colour looks stunning on the eyes. The simple answer to this question? YES. I know that £43 or $39 (in the sale on Sephora) is a lot of money to spend on an eyeshadow palette that only consists of shimmer eyeshadows. However, the quality of these shadows are unlike any other shimmer eyeshadow I have every tried. 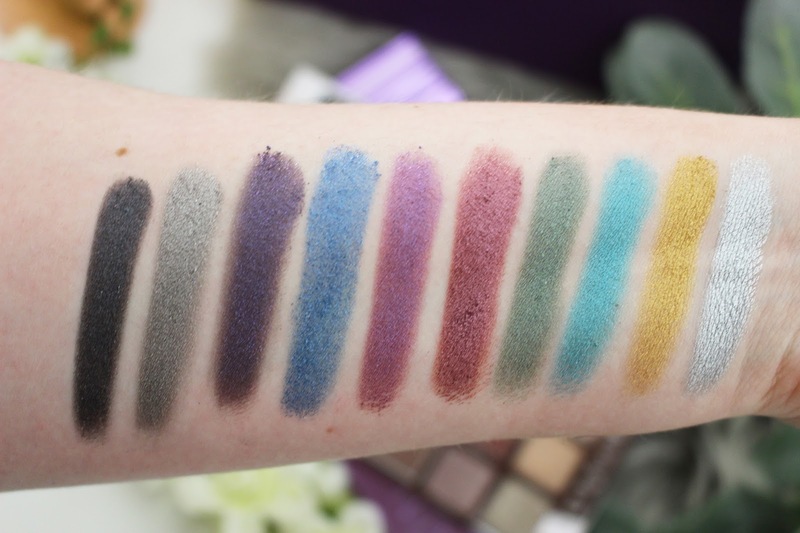 They remind me a lot of the Juvia's Place shimmer shadows and I would say that these might even slightly be better than them (and I am a massive fan of the Juvia's Place eyeshadow palettes). This is the perfect accompaniment to any other eyeshadow palette that you already own. It will transform any look and just give a beautiful metallic finish to the eyes. These are so pigmented, last so long on the eyes and don't crease at all - what more is there to love about an eyeshadow palette. I love the colours that have been used and there are quite a few shades that I wear constantly and then there are some where I have no other eyeshadow like it. Obviously, not everyone will own a lot of other palettes that contain matte eyeshadows that can be used for transition and crease shades. Therefore, I would actually recommend buying a few single matte eyeshadows from Makeup Geek as they are fairly cheap and then you won't have to worry about buying two palettes at once. All you need is a beige/light brown shade that can be used as a transition shade and maybe a warm-toned brown and a darker brown to smoke out an eye look. I know that I am going to be using this palette time and time again and I cannot wait to create more looks with it. 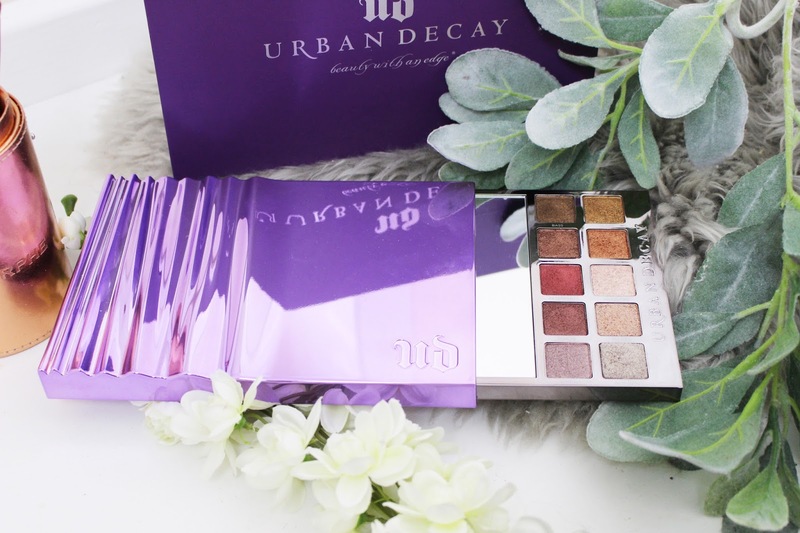 The only let down of this palette is the packaging and the fact that it is not very travel-friendly but apart from that this is the best shimmer eyeshadows I have ever used and I just hope that Urban Decay keep this formula in future palettes as they are completely different to the other shimmer eyeshadows in their other palettes, like the Naked collection. I have read that some people loved the palette and like me, were not a huge fan of the packaging so they were going to depot the shadows into a magnetic palette so that it was more travel friendly and of course that is something you can do if you are not keen on the packaging either. I could only see myself doing that if I was desperate to take this travelling with me, but even then I would probably just tape each end up to make sure that it did not open. Overall, I never thought I would love an all-shimmer eyeshadow palette so much, but I have to admit that this palette is amazing and definitely worth buying; especially at that reduced price on Sephora. This is an incredible palette and is definitely making me think about buying a couple more shimmer eyeshadow palettes, like the new Too Faced Chocolate Gold eyeshadow palette (that only has four mattes in). This palette is sold out online in the UK, but is in some stores for £43 or you can find it in the sale on Sephora for $39 and they do ship to the UK. This is definitely one to get before it is sold out completely! 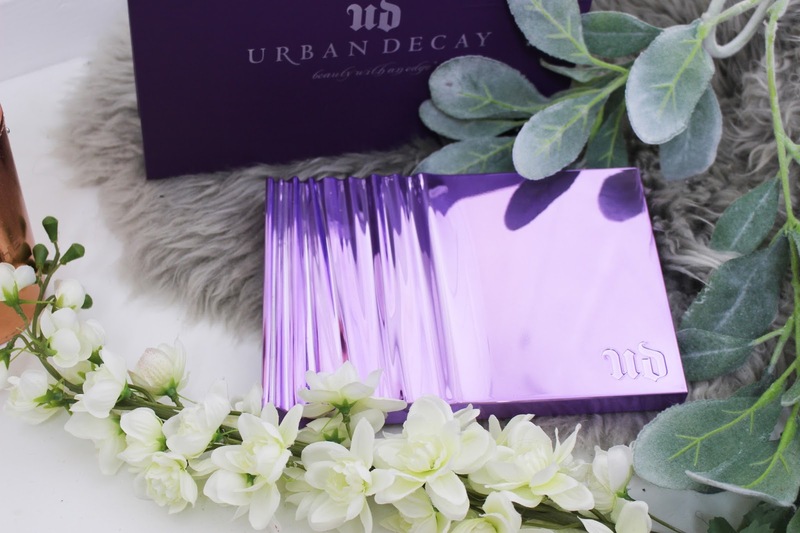 The Urban Decay Heavy Metals eyeshadow palette retails for £43 in some UK stores like Debenhams or for $39 from the Sephora Website. Let me know in the comments if you have this palette and what your thoughts of it are? Also what are your opinions of all shimmer eyeshadow palettes and are there any others that you would like me to review.